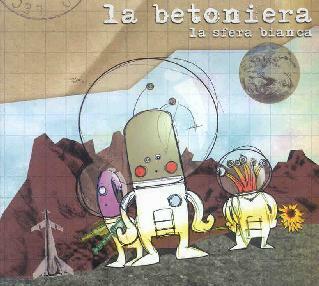 La Betoniera - "La Sfera Bianca"
I know very little about this band but it arrived from Dario Antonetti along with his Effetto Doppler and Vegetable Man Project CD's so I knew it would be worth a listen. La Betoniera is essentially a pop band though they are far more interesting than standard radio fodder as they often transition through numerous musical themes throughout their songs. If any description could be given of their sound it would be bouncy pop-rock with guitar, bass, drums, violin and vocals in Italian from a female singer named Francy. La Betoniera like to incorporate bits of various influences on their songs. There's the country feel from the violin on "La Sfera Bianca". And I liked the combination of Ska (with horns), old rock n roll, and show tune feel on "Bruno Vespa". "Puoi Fare A Meno Di Me" has a strange Bluesy vibe. And while La Betoniera always retain a distinct pop sound, some of the songs do get a bit sophisticated and even a wee bit spacey. "Brucia Amore" has a prog rock feel and an excellent blazing guitar segment with quirky alien synths. A similarly potent guitar sound can be heard on "I Problemi Del Cuore". "Non Vedo Altri Mondi" has more raucous guitar and a brief but mucho cosmic section at the end. "Bistecca Gelato" has a trippy vibe at the beginning and moves quickly through a number of interesting themes. And "Edoardo Agnelli" is a pop tune with a cool spacey bit at the end. So while La Betoniera may not really be for the space/psych crowd, readers who aren't hostile to pop music will be impressed by the bands ability to create interesting and varied arrangements that are accessible and even a bit freaky at times. For more information you can email La Betoniera at: labetoniera@hotmail.com.